In 2004, the Thetford Energy Committee began working with the town Selectboard to review its street lighting policy to remove unnecessary lights, upgrade remaining lights to higher efficiency models that better lit intended areas, and cut electric use for the town. By the end of the project in 2012, they had removed 23 of the town's 46 streetlights, and upgraded the remaining lights to LEDs. These actions cut electrical usage for lights in 2004 from 22,841 kWh to an estimated usage in 2012 of 2,551 kWh - an 89% reduction in energy use for the town's streetlights! Formed streetlight subcommittee including town citizens, TEC members, a select board representative and representative from the town police. Obtained a streetlight inventory of existing lights from CVPS (Central Vermont Public Service Corp, now a part of Green Mountain Power). Toured lights at night to verify actual lights against CVPS inventory. (We found some discrepancies, including one that was not there that the town had been paying for and one the town was paying for that an individual had asked to be installed years before.) Made recommendations for removal, based on sense of need. Generally, we recommended retaining lights in more densely built-out areas of town, and removing those in more sparsely populated areas. Made recommendations to select board to remove about 2/3 of the town's lights. Created maps with GPS showing locations of existing lights, indicating lights recommended for removal. These maps were posted at our town meeting table and public meetings. Organized public meetings with the select board to discuss proposed removals and seek feedback. The Select board removed a few lights from the initial "turn off" list due to public concern. In a remote area where there was an unneeded light, the select board offered to cover the cost of installing personal motion detector lights for one homeowner who was concerned about safety with the light removal. The one-time purchase of motion detector lights would have cost the town less than one month's lease of the streetlight. The homeowner did not take town up on the offer and dropped her resistance to light removal. Arranged with CVPS to do a one-month trial outage of streetlights so we could then collect more public feedback. Held a public meeting following the trial outage, and after public feedback, the select board turned a couple more lights back on. In all, we removed 23 of the town’s 46 streetlights. Went through a long, arduous battle with CVPS to take over ownership of streetlights, because they were resisting installing more energy-efficient options. 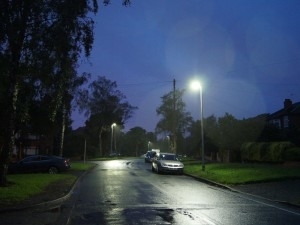 Received a “stimulus” grant to purchase LEDs for all town lights. Purchased and installed all LEDs in 2012.